Mapúa University continues to receive accolades for its research and development (R&D) efforts as it won the 2018 World Summit Award (WSA) for the Smart Settlements and Urbanization category for its Universal Structural Health Evaluation and Recording System (USHER), announced this November. 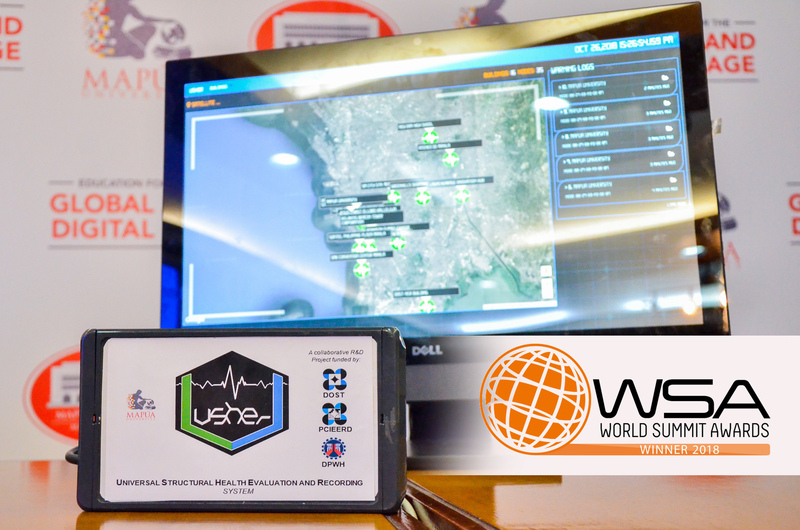 USHER, a building structure health monitoring system composed of an accelerograph or sensor and web portal system, was among the 40 awardees selected from 430 nominations from 182 participating countries. It is the lone Filipino project to receive the recognition for 2018 and the second to do so since the award’s establishment. Initiated in 2003, WSA selects and promotes local digital innovation with high impact on improving society and encourages young entrepreneurship. The project is a by-product of SmartBridge, another Mapúan R&D undertaking that received the 2018 Outstanding R&D Award from the Department of Science and Technology (DOST)-Philippine Council for Industry, Energy, and Emerging Technology Research and Development. Dr. Francis Aldrine A. Uy, USHER project leader and dean of Mapúa’s School of Civil, Environmental, and Geological Engineering, will present the project and will formally receive the award at the WSA Global Congress in March 2019 in Cascais, Portugal. Early this year, USHER also emerged as the best project presentation in the Leaders in Innovation Fellowship, organized by the United Kingdom Royal Academy of Engineering in partnership with DOST and the Asian Institute of Management, which was held in London.